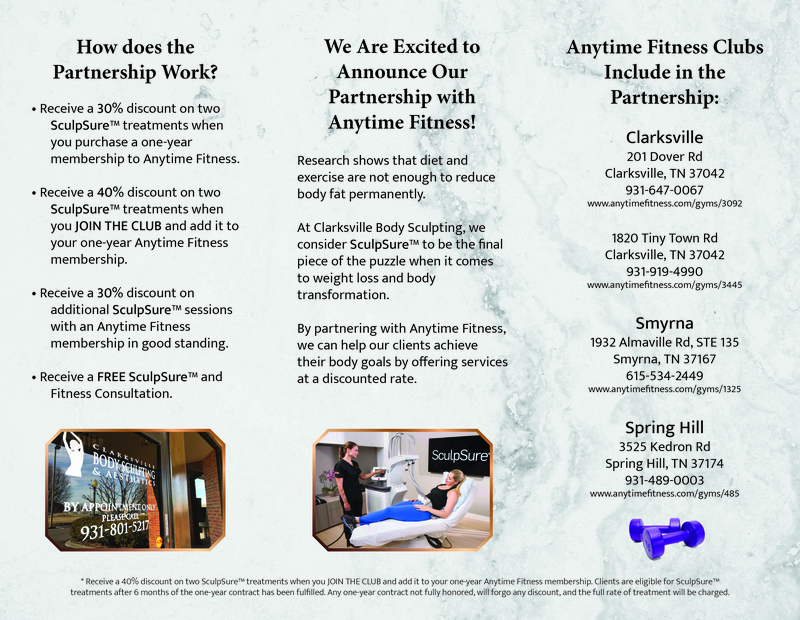 We Are Excited to Announce Our Partnership with Anytime Fitness. Research shows that diet and exercise are not enough to reduce body fat permanently. At Clarksville Body Sculpting, we consider SculpSure™ to be the final piece of the puzzle when it comes to weight loss and body transformations. By partnering with Anytime Fitness, we can help our clients achieve their body goals by offering services at a discounted rate. Receive a 30% discount on two SculpSure™ treatments when you purchase a one-year membership to Anytime Fitness. Receive a 40% discount on two SculpSure™ treatments when you JOIN THE CLUB and add it to your one-year Anytime Fitness membership. Receive a 30% discount on additional SculpSure™ sessions with an Anytime Fitness membership in good standing. Receive a FREE SculpSure™ and Fitness Consultation. * Receive a 40% discount on two SculpSure™ treatments when you JOIN THE CLUB and add it to your one-year Anytime Fitness membership. Clients are eligible for SculpSure™ treatments after 6 months of the 1-year contract has been fulfilled. Any 1-year contract not fully honored, will forgo any discount, and the full rate of treatment will apply.